The Sioux of the Standing Rock and Cheyenne River Agencies, occurred in the winter of 1890-91, involving upwards of one hundred thousand Indians and representing the sixteen great tribes of the North-west, chief among which were the Brules, Ogallalas, and Uncapapas. Led by Big Foot and Sitting Bull, this uprising threatened to be the most stupendous in the history of Indian warfare; but, fortunately, the killing of Sitting Bull and the speedy and masterful concentration of troops under the direction of General Nelson A. Miles demoralized the conspirators, who were awed by the terrible slaughter inflicted on the Indians by the Seventh Cavalry at Wounded Knee, December 29, 1890. For many years the younger element among the Indians on the Standing Rock Reservation had been making great advancement in learning the ways of the white man; and a large number of them, having become Christians, exerted a great progressive influence among the other Indians. This group was in great disfavor with the pagan and unreconstructed element under Sitting Bull, Red Cloud, and Kicking Bear, who eagerly waited for some pretext to bring the question of civilization or non-civilization to a decisive issue. In 1890 the Government had failed to meet promptly many of its treaty obligations, and had been especially lax in the payment of annuities long overdue. Besides, in this year the crops had failed. Congress had cut down the supplies to the Indians, consequently there was a feeling of dissatisfaction among the different tribes and everything was favorable for the irreconcilables under Sitting Bull and his followers to form a conspiracy for a general uprising. Sitting Bull had retreated to Canada, following the Custer massacre, and after passing five years in the Canadian North-west, where he suffered many hardships, surrendered to the authorities at Fort Buford in 1881. He was held as a prisoner of war at Fort Randall, Dakota Territory, and, when released in 1883, he returned to the Indian reservation of the Standing Rock Agency. In the fall of 1890 the Messiah doctrine began to be preached among the Sioux in Dakota. As soon as he heard of it Sitting Bull, although himself too intelligent to give it credence, resolved to make use of it to assert himself, and immediately set to work to spread the new religion among the Indians of the entire North-west, becoming the self-appointed high priest of the cult, in the hope that he would by this means re-establish his former power over the Indians, and, again becoming their leader, incite them to an uprising against the whites, whom he so fiercely hated. This prediction of the second coming of Christ was founded on the philosophy of the Christian religion and originated about 1888 among the Paviotso in Nevada. Its prophet was a young Paiute Indian, by name Jack Wilson, who announced that he had received a direct revelation from the God of the Indians. He proclaimed that a new dispensation was to occur; that the Indians were to be restored to their inheritance and to be reunited with their departed friends, whom, at the appointed time, the prophet was to restore to life. The plains were again to teem with vast herds of wild horses; the buffalo was again to return and roam the country as in the days of old�indeed, the earth was to become an Indian paradise in which the red man was to reign supreme. These deluded people were told that they must prepare for the coming of the Messiah by practising songs and dance ceremonies, which consisted of a ceremonial religious dance, commonly known as the spirit, or ghost, dance, in which "the dancers, men and women together, held hands and moved slowly around in a circle, facing towards the centre, keeping time to songs that were sung without any instrumental accompaniment. Hypnotic trances were a common feature of the dance." This fanatical doctrine predicting the inauguration of the Indian millennium rapidly spread to the Indian tribes east of the Rockies, the prophet in far-off Nevada having sent trusted medicine-men among the different tribes, who informed the Indians in each tribe of the coming of the Messiah. The prophecy had been circulated among the Indians in Dakota with the utmost secrecy; no knowledge of it had been discovered by any of the Government agents during the period from 1888 to 1890, while the teaching had been spreading among the tribes. 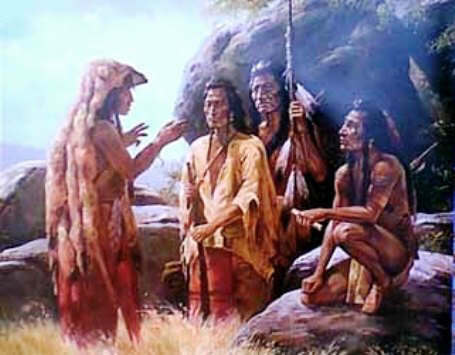 Learning of the doctrine from Kicking Bear, a fierce fighting member of the Minneconjoux tribe who had returned to the reservation after having made the journey to the tribes in Utah and Nevada, where he and other Dakota Indians had been received by the prophet, Sitting Bull immediately had Kicking Bear initiate him into the mysteries of the new religion, and soon established himself as high priest among the Indians on the reservation. All those desiring to take part in the ghost-dancing must first purify themselves by taking a steam bath every morning. These baths were taken in specially prepared tents in which there was room for not more than three or four persons; stones were heated and inserted into the tents, and when sprinkled with water a hot steam arose, which, confined within so small a space, soon started a vigorous sweat. After the bath the Indians to be initiated were annointed by the medicine-man, and then began the dance, which continued for hours at a time, accompanied with the chanting of weird melodies, till the devotees dropped from sheer exhaustion. Under the spell of this religious craze the Indians soon began to show dangerous symptoms of disorder, and the authorities immediately decided that the best way to stop the ghost-dancing was to arrest Sitting Bull, who was teaching the Indians this madness at his camp on Grand River. He sent Indian runners to every tribe in the great North-west, even as far as Canada, begging them to leave their reservations and in a body go forth to meet the Messiah. He saw that the ghost-dance religion with the expected Indian millennium was taking strong hold of the minds of the Indians and that it gave him the means of exciting the deluded savages into a mad frenzy, and that while they were in that state of mind his chance of bringing about the outbreak of rebellion which he had been planning ever since his return to the reservation in 1883 would more than likely meet with success. His arrest, therefore, must be accomplished. It was known that he was sending Indian runners to the Sioux of the Cheyenne River Reservation and that he was making preparations to depart from his own camp on Grand River. He was defiant of all authority. Up to this time he had gone regularly to the Agency for his rations, but now, fearing arrest, and resolved to keep the officers from laying hands on him, he sent in his stead Bull Ghost, his chief lieutenant. During this excitement a large body of troops under General Brook had arrived at Pine Ridge; this caused terror to spread among the Indians on the reservation, and, becoming frightened and desperate, about eighteen hundred of them left their homes and fled to the Bad Lands. It was Sitting Bull's intention to join this body of disaffected Indians. Big Foot's band of Minneconjoux Sioux had already fled from their Agency on the Missouri River and were making for the camp of hostiles in the Bad Lands. It was, therefore, of the greatest importance to prevent Sitting Bull from escaping and putting himself at the head of these desperate and frightened red men, for his presence in the camp of the hostiles would inevitably result in a most disastrous war�the most stupendous of all Indian wars in history. Accordingly, General Miles, on December 15, 1890, ordered Colonel Dunn, the post commander at Fort Yates, North Dakota, to detail a troop of cavalry and a few trusted Indian police to arrest Sitting Bull at his camp on Grand River. It was considered advisable, in order to avoid bloodshed, to have the arrest made by the Indian police; consequently the troop of cavalry under the command of Major E. G. Fechet, and the Indian police under Lieutenant Bull Head, left Fort Yates at midnight in order to reach Sitting Bull's camp at daybreak, when conditions would be most favorable for making the arrest. The arrival of the Indian police was timely, for Sitting Bull had made all his arrangements to decamp that very morning to join the great hostile camp that had already congregated in the Bad Lands of South Dakota, whence they were to move west to join the other tribes at the base of the Rocky Mountains. The Indian police found Sitting Bull at his camp, surrounded by his family. Sitting Bull, protesting, but offering no resistance to the unexpected arrest, prepared to accompany the Indian police outside his lodge, first requesting to be allowed to saddle his best horse and to wear his Sunday clothes. Outside, however, were congregated a large body of ghost-dancers, most of whom were armed, and among them Crow Foot, his son, who reviled his father as a coward for yielding so peacefully to arrest. Sitting Bull was stung by this taunt from his son, and, seeing the throng of ghost-dancers in a wild frenzy of rage at the interruption of their ceremonies and wrought to the highest pitch of excitement at the capture of their leader, regarded by them as more than human, he immediately raised the war-cry and his followers rushed to rescue him. There then ensued a desperate combat, which resulted in the killing of Sitting Bull with a number of his immediate followers, and several of the friendly Indian police, among whom was Lieutenant Bull Head and Shave Head. Catch-the-Bear and Strikes-the-Kettle at once aimed their rifles and fired point-blank at the Indian police. "Catch-the-Bear's shot struck Bull Head in the side, and he, wheeling, turned on Sitting Bull and shot him in the left side; and as Strikes-the-Kettle's shot had passed through Shave Head's abdomen, all three fell together. Catch-the-Bear, who fired the first shot, was immediately shot down by Private Lone Man, and the fight became general." The remaining police, however, holding their ground, gained possession of Sitting Bull's lodge and its contents, and were soon joined by the troops under Major Fechet, who had been kept in reserve at a short distance in case of trouble. The troops soon drove the ghost-dancers off the scene. Thus ended the career of Sitting Bull, the mighty medicine-man of the Sioux, shot to death by members of his own race, who was, in the opinion of General Miles, "the strongest type of the hostile Indian that this country has produced." The death of Sitting Bull did not, however, put an immediate end to the Indian trouble. There still was a large camp of the hostiles in the Bad Lands; these were now joined by the remnant of Sitting Bull's band which the troops had dispersed after the attempt to rescue the great medicine-man had failed. Congregated in the Bad Lands, in anticipation of the general uprising that was to take place, the fierce, warlike spirit of these savages was whipped into a veritable fury to avenge the death of their great leader. Encamped in this inaccessible country of barren hills, deep canons, and ravines, plentifully supplied with horses, which they had obtained by raiding neighboring ranches, well equipped with arms and with ample stores of ammunition, the Indians felt confident of being able to defy the Government. Here they kept up their mad ghost-dancing, proclaimed the coming of the Messiah, and made every effort to arouse the Indians that still remained peaceful at the different agencies. Their threatening attitude spread a feeling of terror among the whites living at the agencies and in isolated settlements, who were aware of the comparatively weak force of troops immediately available for their protection. It became necessary, therefore, at once to send for reinforcements. A large force was soon brought up and the troops began their march on the camp of the hostiles. It was the plan not to bring on a general engagement, but to drive them back towards their Agency at Pine Ridge. To capture and disarm Big Foot's band, which had left the Cheyenne River Reservation after the killing of Sitting Bull, was the chief objective of the troops. Before leaving home this band, numbering about three hundred men, women, and children, had destroyed their wagons and other immovable supplies, which clearly showed their intention of going to war. They were now on their way to join the other hostiles in the Bad Lands. For the purpose of intercepting this dangerous band, the first battalion of the Seventh Cavalry, in command of Major S. M. Whitside and consisting of two hundred and thirty-two men and ten officers, left their camp at Pine Ridge December 26. The command reached Wounded Knee Creek that same night, and the following day scouting parties were sent out to scour the surrounding country, for some sign of the Indians. Finally, on the 28th, one of the Indian scouts discovered Big Foot's band marching in the direction of the Pine Ridge Agency and entirely unconscious of the near presence of troops. The camp at Wounded Knee being informed of the approach of the Indians, mounted troops at once set out, and soon encountered the Indians, the warriors on horseback and the women and children in wagons or travois in the rear. A demand was made for their surrender, and Big Foot, encumbered as he was with the women and children, could offer no resistance. The band, consisting of one hundred and twenty warriors well armed and supplied with ammunition, and upwards of two hundred and fifty women and children, surrendered, and the command started for the camp at Wounded Knee Creek. There ground was assigned for their village and rations served them. At nightfall the camp was closely guarded; the sentinels were ordered to permit neither exit nor entrance, for it was recalled that only a few days previous this band had surrendered to the Eighth Cavalry under Major E. V. Sumner, but had escaped the first night because the commander, relying upon their promise to return to the Agency, did not disarm them and guard their camp. In the present case the troops only very slightly exceeded the male Indians in number, and it was, therefore, considered unwise to attempt to disarm them until reinforcements could be brought up. Accordingly, General Brooke was advised of the situation, and he at once despatched the remaining battalion of the Seventh Cavalry, in command of General Forsyth, which arrived at Wounded Knee at 8:30 p.m. The presence of this large body of troops, it was felt, would be a guarantee against any disturbance when the attempt to disarm the Indians should be made the next day. The next morning, December 29, a council with the Indian leaders was held, General Forsyth informing them that they must give up all their arms and ammunition. The Indians insisted that they had no arms. Upon this refusal troops were massed around the camp of the hostiles; the warriors were lined up and commanded to give up their guns. The braves at once assumed a sullen, defiant attitude. They were clad in the hideous ghost-shirt which they superstitiously believed would protect them from bullets, and they assuredly intended trouble, although at the time the soldiers had no expectation of the bloody battle about to take place. Each Indian wore a blanket folded over his shoulder, underneath which was concealed a rifle; this, of course, was not known to the soldiers. As the military force numbered four hundred men, no expectation of an attack was considered probable. Twenty of the Indians taken out of the line were ordered to go to the village and bring in their guns, but the result of their search only yielded a few old, valueless weapons. It was known that the Indians were well armed with Winchesters only the day before, and General Forsyth realized that a search of their persons must be made in spite of the danger involved in doing so. Accordingly, a detachment of troops consisting of one hundred men, fully armed, were disposed at right angles on two sides of the semicircle of warriors. Before the order for personal search could be executed the Indians, believing that they were about to be killed, commenced the ghost-dance upon a signal from the medicine-man, who took a handful of earth from the ground and tossed it over his shoulders. At this signal the whole body of painted, bedizened fanatics sprang as one man, flung off their blankets, and with nothing but breech-clouts and light ghost- shirts to impede them, began firing into the ranks of the soldiers; so rapidly was this done that the whole line of Indians had fired before the soldiers realized the situation. This treacherous attack resulted in the loss of twenty-five troopers killed and fifty-five wounded, many of the wounded dying soon after. The soldiers, however, kept perfect discipline and returned the fire with great effect. After a desperate struggle, in which there were many single-handed combats, the surviving warriors made a headlong rush for their tepees and thence into the adjoining village. Here death was dealt out to them by the men of A and I troops, dismounted and disposed on that side. The retreating Indians were pursued by the troops of the second battalion who with their Hotchkiss guns poured destruction among them. Many of the shots directed at the warriors found victims among the women and children; everything was done to prevent injury to these people, but in the excitement it was unavoidable. Also the troops themselves were so placed that the soldiers at the beginning of the attack having formed a parallelogram about the Indians, and in the confusion that followed the first volley many of the troopers fell from the fire of their comrades. The result of this battle was disastrous to both sides. Of the Indians, including Big Foot himself, eighty-nine are known to have been killed and ten to have been badly wounded; and of the remaining twenty-one, fourteen were killed, six wounded, only one escaping unhurt. As for the women, sixty or seventy were killed and an equal number wounded, among them a sister of Sitting Bull. Considering the numbers engaged, the loss was appalling, making this engagement one of the most disastrous of any Indian battle since the Custer fight on the Little Big Horn. This tragedy, occurring but a short distance from the hostile camp in the Bad Lands, greatly excited the Indians there encamped, and it was feared that nothing could prevent a serious and devastating war. The Seventh Cavalry arrived at Pine Ridge late in the night of that dreadful and bloody day, carrying their wounded. They found the people at the Agency in a state of terror, for only a few troopers had been left there, and the Indians threatened to attack the Agency from the surrounding hills, which they occupied with a strong force. At this juncture of affairs General Miles arrived at the Pine Ridge Agency and at once undertook energetic measures to stamp out the rebellion, assembling a force of nearly three thousand troops, which slowly drew a ring of iron about the hostile camp. The Indians were prevented from scattering into small bands, and eventually the troops occupied positions between the Indians and their stronghold in the Bad Lands. The steady advance in force of the troops overawed the Indians, and, although the fierce Brul�s were still in a hostile mood, the main body of the Indians drew nearer and nearer to the Agency, until finally some of the chiefs of the Ogallalas came in for a conference with General Miles. Young-Man-Afraid-of-His-Horses, one of the most powerful of the Sioux chiefs, and friendly to the whites, influenced the Ogallalas to desert the hostile camp, with the result that this band was shortly encamped with their friends of the same tribe who were on the south side of the Agency. The Brul�s still maintained their defiance, moving, however, still closer to the Agency. The troops meanwhile continued their show of force without making any actual attack, intending merely to overawe this fierce band. General Miles had sent word among them, assuring them of a strict compliance with the terms of their treaty and that their grievances would be redressed if they would quietly surrender. The efforts of General Miles finally met with success, and the large camp of hostiles returned to the Agency and promised to keep the peace for the future, realizing that they could no longer contend against the organized military power of the United States. At Wounded Knee they had learned that treachery was swiftly punished and that the representatives of the governmental authority must be obeyed. At this time there were about ten thousand Indians camped about and around Pine Ridge. A demand was made for the Brul�s to surrender their arms, but only a few of them volunteered to give up their weapons, and considering the large number of Indians and the possible outcome if they resisted, it was considered best not to enforce this order. The Indians were soon sent back to their different agencies. The Brul�s returned to their own reservation at Rosebud. As a guarantee of their future good behavior and to prevent the possibility of any further conspiracies, thirty of the leaders responsible for the uprising were gathered together and sent to Fort Sheridan, near Chicago, and included in this body were Kicking Bear and Short Bull, the two men who had the year before crossed the mountains to meet the Messiah in Nevada. Some time later it was thought desirable to remove others of the malcontents among the Brul�s, so a number of the most dangerous members of the tribe were turned over to Colonel Cody, who employed them in exhibitions in his Wild West show. "There were many stirring and grandly picturesque scenes at Pine Ridge during the closing days of the late campaign against the ghost-dancing Sioux, but the one of most absorbing interest was the final review by General Miles of the thirty-five hundred soldiers, who had marched through sand-storms and blizzards in order to complete the cordon of bayonets that was to slowly drive the savages to unconditional surrender. The night before the review, haranguers, with little medicine-bags tied about their strange garments, went through the villages of the hostile and sullen Brul�s and the peaceable Ogallalas, telling their people of the military demonstration which was to take place in the morning. "When the sun came up the ridges skirting the Agency to the east and west were fringed with Indians, who looked like Arab sheiks in their white sheets and hooded heads. Not a squaw was to be seen among all those ghostly figures, so distinctly outlined against the horizon. Statuesque and haughty, the warriors stood watching the flying columns of cavalrymen and the explosive efforts of the cannoneers as they urged their animals into line. Down in the same valley, where the troops were hurriedly preparing for their man�uvres, but nearly a mile away to the north, were the great Indian villages, with the squaws corralling their thousands of ponies, as a precautionary measure against any possible hostile demonstration on the part of the army. "General Miles was not in uniform as he sat astride a big coal-black horse, which stood on the crest of a knoll on the right flank of the advancing column of soldiers. Even his three-starred epaulets, the only evidences of his rank, were beneath a great overcoat which was buttoned almost to his ears. Just as the column, with screaming trumpets, began to pass General Miles, a furious sand-storm swept through the valley. It cloaked the silent Indian villages in a yellow, swirling shroud, and then tearing along as though blown from a funnel, pierced the most compact lines of infantrymen, who were marching with a swinging stride behind Colonel Shafter. From their perches on the summits of the snow-flecked buttes, the hooded warriors must have thought that the long line of men and horses below had stampeded, for that terrible torrent of sand completely cloaked the army to the vision of those who were above the phenomenal current of air. "There was no cheering during all the time the great column passed in review. Now and then General Miles's black hat went off to the flash of a saluting sabre held by a muffled figure that was crouching before the choking blast, but it was not until the Sixth Cavalry, with grim old General Carr at its head, passed in review that the idol of the Indian-fighters showed the keen interest he was taking in the demonstration. Again and again his black sombrero fell as Carr's sword gleamed from his fur cap to his spurs. And when the black, scowling faces of the Ninth Cavalry pressed in close lines behind glittering carbines held at a salute, General Miles waved his gloved hand to Colonel Henry, whose gaunt figure was almost lost in the folds of his buffalo overcoat. Three weeks before, these black troopers rode one hundred miles without food or sleep to save the Seventh Cavalrymen, who were slowly being crushed by the Sioux in the valley at the Catholic Mission. Then they dashed through the flanks of the savages, and, after sweeping the ridges with carbine and pistol, lifted the white troopers out of the pocket with such grace that, after the battle was over, the men of both regiments hugged one another on the field. "When the trumpeters of the Seventh Cavalry got in front of General Miles they blew a shrill blast and passed on into the blinding storm. Then the musicians from Angel Island played 'Garryowen.' This was Custer's charging music, and as the famous regiment came over the yellow knolls in company front and carbines at a salute, the horses began to dance to the irresistible melody. Major Whitside was in command. He had no sword, but he waved his hand. General Miles's emotion was now so intense that he hung his hat on the pommel of his saddle and let the storm toss his gray hair as far as it pleased. The capes of the troopers were flung back, exposing the lemon-colored linings, and the fur caps were tied in such a way under the chin that they gave the wind-tanned faces a peculiarly grim expression. The scars of three days' fighting were plainly visible in this grand regiment. "There were men missing in every troop, and poor Captain Wallace and brave Lieutenants Mann and Garlington were also gone. A second lieutenant, with a bandaged head, was the only officer of little K Troop; and bringing up the rear was B Troop, with one-third of its men either in graves or on hospital-cots. "The column was almost pathetically grand, with its bullet-pierced gun-carriages, its tattered guidons, and its long lines of troopers and foot-soldiers facing a storm that was almost unbearable. It was the grandest demonstration by the army ever seen in the West; and when the soldiers had gone to their tents the sullen and suspicious Brul�s were still standing like statues on the crests of the hills." This story of the Sioux War is featured in the book entitled the Indian History for Young Folks by FrancIs F. Drake and was published by Harper Brothers in New York and London in 1919.